I had some time for just coloring and today I put together some cards, I want to share this one with you. I colored the egg in distressed inks. My papers are from Echo Park and MME. I used different florals and wound them together with feathers from our chicken. The crystal at the bottom is egg shaped and I thought it finished it nicely. 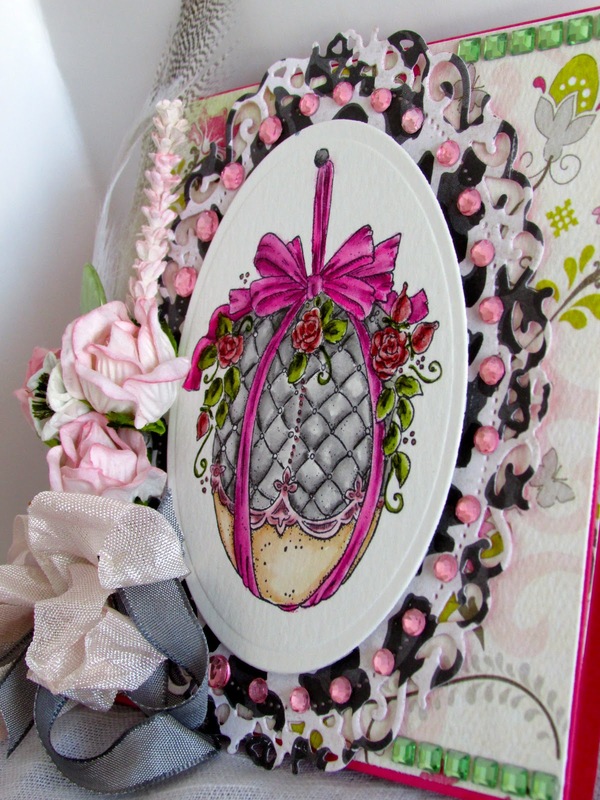 I used 2 different spellbinders dies to display the egg on. Then I put crystals around the egg and edge. My colors are a bit off but they are all shades of pinks and I think the card looks better in person. 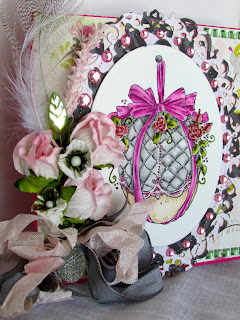 Here is the inside of the card where I have the mini eggs and a sentiment from Magnolia. My new Memory box ribbon die, just had to have! Beautiful! So much to admire. Gorgeous inside and out. Those flourishes are great on the inside. I've never seen then that long. Real nice Kelly! Nice feathers too. Do you pluck them as you need them ? Cluck, cluck , cluck LOL! Ps you can come over any time and use my toys! WOW....this is absolutely exquisite, Kelly. 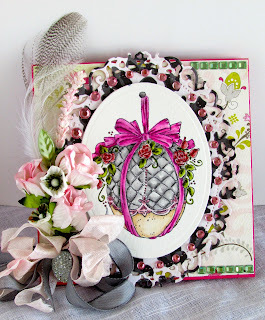 Love the ribbon die.....must check it out!!!! Beautiful Kelly so so stylish. I love this memory box ribbon, it is so delicate and perfect to wrap the inside of your card. Very very lovely! Hugs. Wow, this is so pretty - an utterly lovely piece of work! Wow Kelly your card is so pretty, love all your details. Lovely Easter card, Kelly. Gorgeous coloring on you egg and beautiful flowers, ribbon and feathers. Thank you for sharing it with us at Magnolia-licious & Wee Stamps. Kelly you have done a STUNNING job with this image!! What a beauty of a card..
Kelly, this is really beautiful!! The egg is gorgeous!! I love it!! 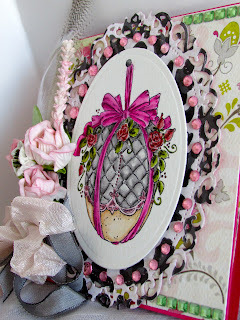 Thank you so much for sharing your wonderful talents with us at Magnolia-licious and Wee Stamps Challenge Blog!